Months after introducing the revolutionary Moto Z with the modular Moto Mods, Lenovo is now all set to launch the handset in India, right in time for the festive season. Lenovo has sent out press invites for its upcoming launch event scheduled for October 4. The company is expected to release the Moto Z smartphone along with the Moto Mods modular accessories, which can be attached to the handset using the pins located at the bottom back. 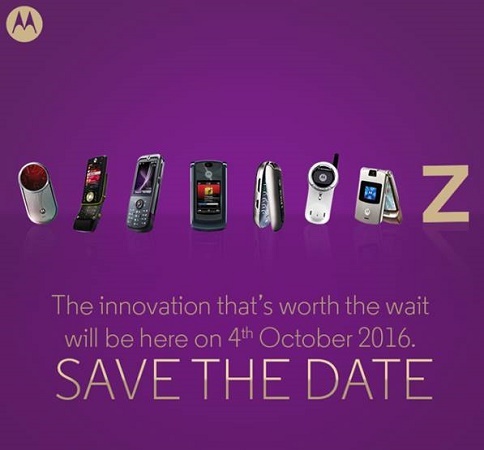 There is no mention whether the company would also launch the Moto Z Force at the event. The Moto Z, which is touted to be one of the world’s slimmest smartphone, sports a full metal unibody design with a fingerprint scanner. The device has a 5.5 inch Quad HD display and is powered by the Snapdragon 820 processor with 4 GB of RAM. Also present is a 13 MP rear facing and a 5 MP front facing camera.